Acumen LPO - India's premier legal process outsourcing (LPO) company, dedicated to cater to the overseas clientele in providing efficient services in the changing global scenario. High accessibility and prompt service, at an economical value, keeps us apart from other entities. 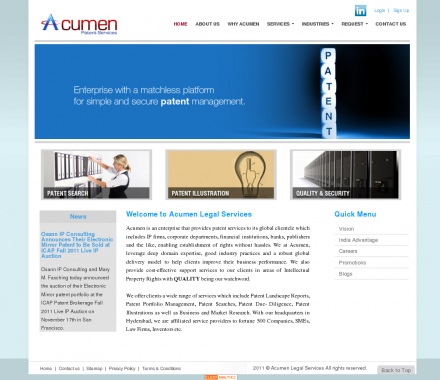 Description: Acumen LPO - India's premier legal process outsourcing (LPO) company, dedicated to cater to the overseas clientele in providing efficient services in the changing global scenario. High accessibility and prompt service, at an economical value, keeps us apart from other entities. Telephone Systems (Popularity: ): Alliancetelecom primarily supply Nortel, Norstar, Avaya and Toshiba products to small as well as large business houses and offices.